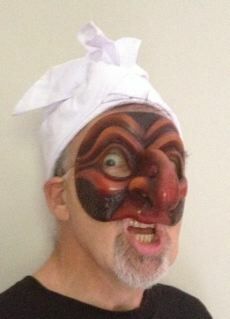 Another kind of working class hero is Pulcinella from Napoli. The mask for this pot-bellied hunchbacked cuss is strikingly similar to the mask of Maccus, from the ancient Roman Comedies and is recognizeable for its huge hook beak of a nose. Pulcinella spawned the very politically incorrect (and hugely popular) "Mr Punch" of the brutal English "Punch and Judy" puppet shows and became the mask of "Teaser" in the bawdy "Obby 'os and Teaser" fertility ritual.